IFA 2017: SanDisk iXpand Base for iPhone announced, Backs up photos and videos while charging. SanDisk today expanded its line of iPhone mobile storage solutions with the SanDisk iXpand Base. 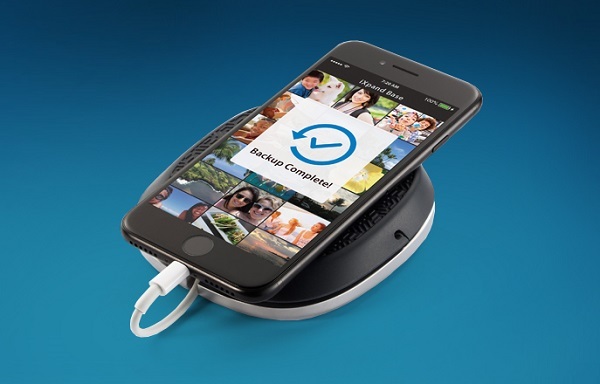 The new offering is perfect for consumers looking for a convenient way to back up their iPhone photos, videos and contacts. With iXpand Base, there's no need to change any daily habits, users simply plug their iPhone into the iXpand Base and automatically back up their content while the phone is charging. With up to 256GB of local storage, the SanDisk iXpand Base gives consumers plenty of room to automatically save files in their original quality, with no need to pay monthly fees for cloud-based storage. The iXpand Base is designed with a compact form factor, allowing it to conveniently sit on a nightstand or desk, has a soft rubber top to place a phone and a wrap-around groove to keep a Lighting cable tidy and organized. iXpand Base is engineered to quickly charge an iPhone with 15W of power while backing up all of its data via the companion iXpand Base app. Restoring backed up content to an iPhone is also fast and easy. Whether restoring to a current phone or a new one, consumers simply plug in, open the iXpand Base app and tap restore to transfer files back to the iPhone. The SanDisk iXpand Base is available now at SanDisk.com, Amazon, BestBuy.com, B&H Photo Video.com and other major retailers, with U.S. manufacturer's suggested retail prices (MSRPs) of 32GB/$49.99, 64GB/$99.99, 128GB/$129.99 and 256GB/$199.99.